Maya Deren was born Eleanora Derenkowsky, during the Russian Revolution, to a Russian-Jewish family in Kiev. She is said to have been named after the great Italian actress Eleonora Duse. As a small child, she and her parents fled anti-Semitic persecution and emigrated to the USA, settling in New York, where they anglicized the family name to Deren. The family was separated when she was sent to Geneva to attend the League of Nations School and her parents continued their own studies in Paris and New York. She went to Syracuse University, where she became involved in left-wing politics. She then transferred to New York University, where she was awarded her undergraduate degree in 1936. She completed a master's degree in English Literature with a thesis on symbolist poetry at Smith College in 1939. After college, she worked as an assistant to dancer-choreographer Katherine Dunham, touring and performing with the Dunham Dance Company across the USA. In Los Angeles in 1941, she met Alexander Hammid, a Czech film producer, with whom she collaborated on several innovative films such as Meshes of the Afternoon (1943) and At the Land (1944). Returning to New York City two years later, she changed her name to Maya and married Hammid. Maya Deren became a passionate supporter of experimental cinema, writing, producing, directing, editing, and photographing such noted films as A Study in Choreography for Camera (1945), Ritual in Transfigured Time (1946), and The Very Eye of Night (1958). She wrote An Anagram of Ideas on Art, Form and Film (1946). She parted from Hammid and married Teiji Ito, a Japanese composer. In 1947, Maya won a Guggenheim Fellowship to study voodoo ritual in Haitian culture. This resulted in the documentary Divine Horseman: The Living Gods of Haiti (1977), which was released posthumously. 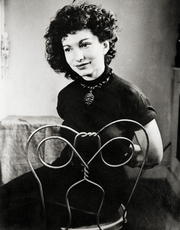 Maya Deren served as a muse and inspiration to many other avant-garde filmmakers. She died at age 44 from a brain hemorrhage. Maya Deren is currently considered a "single author." If one or more works are by a distinct, homonymous authors, go ahead and split the author. Maya Deren is composed of 1 name.